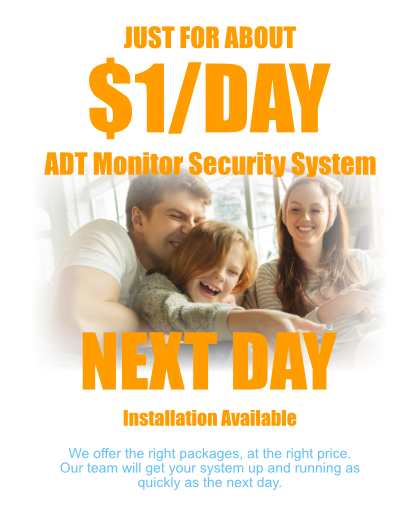 With $99.00 installation fee and purchase of alarm monitoring services (Terms and Conditions below^). See important terms and conditions* to this offer. By checking this box, you consent for Protect Your Home to use automated technology to contact you at the number provided above regarding home security. You are not required to provide this consent to make a purchase from us. ADT, LLC. - America's leading security company, was founded over a century ago. For years, ADT has been the number one trusted source of protection for millions of families, homes and businesses. By signing up for ADT monitoring, you are ensuring that trained professionals with the most sophisticated and innovative security devices – including home security doors – are monitoring your home at all times, 24 hours a day, 7 days a week. ADT monitored security systems allow you and your family to take advantage of technological advances like home security camera systems and other high-tech home security products. Many of ADT's monitoring services aren't even available from competitors. But, fear not, you will receive an alarm manual to look over if you have questions after your system is installed. After signing up for an ADT monitored security system, a Protect Your Home installation Technician will come out and install the home security system, including wireless sensors if purchased, at your home. This is valued at $850, but with Protect Your Home you can have it installed for under $100*. Protect Your Home also offers monthly ADT monitoring plans starting as low as $36.99. Because we have over 150 home security system installation service centers across the nation, most locations can have an ADT monitored security system installed next day. Once your home is equipped with the security system, it is connected to a network of ADT Customer Monitoring Centers nationwide, delivering non-stop security 365 days a year. This means you can instantly begin taking advantage of the centers' staff of knowledgeable professionals utilizing cutting-edge equipment. The moment an alarm signal is received from your home, a notice is delivered to you and local authorities by an ADT professional. Take a look for yourself at what people think about ADT monitoring by reading the home security reviews on the testimonials page of our website. ©2018 Protect Your Home - ADT Authorized Premier Provider. All rights reserved. Up to 15 sensors free for pre-wired homes or up to 7 wireless sensors free. No substitutions allowed. Labor charges may apply. $100 Visa Gift Card fulfilled by Protect Your Home through third-party provider, Mpell, upon installation of a security system. Shipping and Handling Fee applies. $99 Customer Installation Charge. 36-Month Monitoring Agreement required at $27.99 per month ($1,007.64). 24-Month Monitoring Agreement required at $27.99 per month ($671.76) for California. Form of payment must be by credit card or electronic charge to your checking or savings account. Offer applies to homeowners only. Local permit fees may be required. Satisfactory credit history required. Termination Fee applies. Certain restrictions may apply. Offer valid for new ADT Authorized Premier Provider customers only and not on purchases from ADT LLC. Other rate plans available. Cannot be combined with any other offer. The $27.99 Offer does not include Quality Service Plan (QSP). Quality Service Plan (QSP) is ADT’s Extended Limited Warranty. 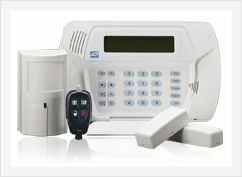 ADT Pulse Interactive Solutions Services, which help you manage your home environment and family lifestyle, require the purchase and/or activation of an ADT alarm system with monitored burglary service and a compatible computer, cell phone or PDA with Internet and email access. These ADT Pulse Interactive Solutions Services do not cover the operation or maintenance of any household equipment/systems that are connected to the ADT Pulse Interactive Solutions Services/Equipment. All ADT Pulse Interactive Solutions Services are not available with the various levels of ADT Pulse Interactive Solutions Services. 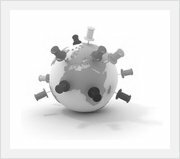 All ADT Pulse Interactive Solutions Services may not be available in all geographic areas. You may be required to pay additional charges to purchase equipment required to utilize the ADT Pulse Interactive Solutions Services features you desire. In accordance with the FTC guidelines concerning use of endorsements and testimonials in advertising, please be aware of the following: Testimonials appearing on this site are actually received from consumers via text, audio and/or video submission. They are the individual experiences, reflecting real life experiences of those who have used our products and/or services in some way or another. However, they are individual results and results do vary. Protect Your Home does not claim that they are typical results that consumers will generally achieve. 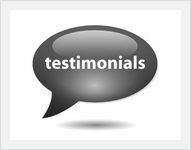 The testimonials are not necessarily representative of all of those who will use our products and/or services. Testimonials displayed (text, audio and/or video) are given verbatim except for correction of grammatical or typing errors. Some have been shortened. In other words, not the whole message received by the testimonial writer is displayed, when it seemed lengthy or not the whole testimonial seemed relevant to the general public. Protect Your Home is not responsible for any of the opinions or comments posted on this site. Protect Your Home does not share the opinions, views or commentary of any testimonials on this site, which are strictly the views of the reviewer. Protect Your Home has not compensated these consumers for their testimonials/reviews. Licenses: Licenses: AL-17-1104, Alabama: 19-001104, AZ-ROC217517, AR-2008-0014, CA-ACO6320, CT-ELC.0193944-L5, DE-07-212, FL-EC13003427, DC-602513000006, GA-LVA205395, ID-ELE-SC-39312, IL-127.001042, IN-City of Indianapolis: LAC-000156, IA-AC-0036, KY-City of Louisville: 483, LA-F1082, LA-F1914, LA-F1915, ME-LM50017382, MD-107-1626, MA-1355C, MI-3601205773, MN-TS01807, MS-15007958, MO-City of St. Louis: CC354, St. Louis County: 89935, MT-247, NE-14451, NV-68518, City of Las Vegas: 3000002944, NJ Burglar Alarm Lic. NJ-34BF00021800, NM-353366, NY-Licensed by the N.Y.S. Dept. of State UID#12000317691, #12000286451, NC-1622-CSA, OH-53891446, City of Cincinnati: AC86, OK-1048, OR-170997, Pennsylvania Home Improvement Contractor Registration Number: PA022999, RI-3582, SC-BAC5630, SD-1025-7001-ET, TN-1520, TX-B13734, ACR-3492, UT-6422596-6501, VT-ES-2382, VA-115120, WA-602588694/PROTEYH934RS, WV-042433, WI-City of Milwaukee: PAS-0002886, WY-LV-G-21499.